Combinatorial optimization is a multidisciplinary scientific area, lying in the interface of three major scientific domains: mathematics, theoretical computer science and management. 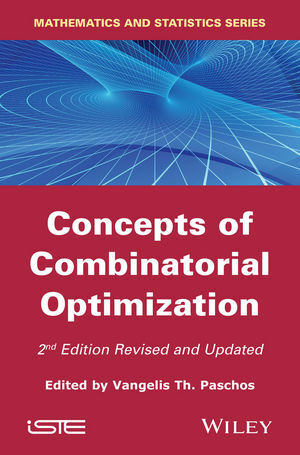 The three volumes of the Combinatorial Optimization series aim to cover a wide range of topics in this area. These topics also deal with fundamental notions and approaches as with several classical applications of combinatorial optimization. - Elements from mathematical programming, presenting fundamentals from mathematical programming based methods that are in the heart of Operations Research since the origins of this field. Vangelis T. Paschos is Professor of Computer Science at the University of Paris-Dauphine and Chairman of the LAMSADE (Laboratory for the Modeling and the Analysis of Decision Aiding Systems). His research interests include complexity theory, the theory of the polynomial approximation of NP-hard problems, probabilistic combinatorial optimization and on-line computation. He is the author of more than a 100 research papers and is a member of the editorial board of several international scientific journals.